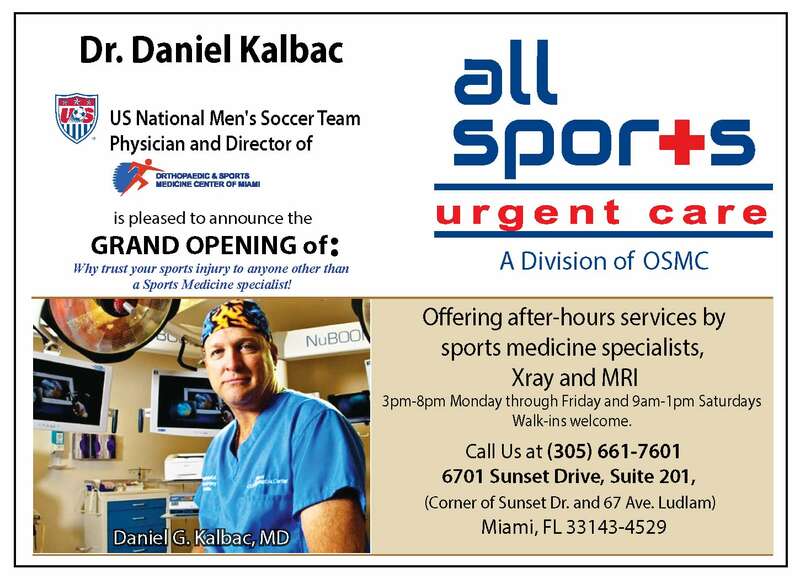 South Florida’s premier sports medicine and orthopaedic service treating sports medicine and general orthopaedic injuries. Our services include the evaluation, diagnosis, and treatment for injuries involving the Shoulders, Knees, Ankles and several other Musculoskeletal structures in the body. Headed by Dr. Daniel G. Kalbac, our team of Board Certified Physicians and Surgeons with the help of our Orthopaedic Certified Physicians Assistants has more than 80 years of combined experience. After an injury, let us help you heal. For quality care and more than 25 years of experience serving the Miami area, turn to Orthopaedic & Sports Medicine Center of Miami. Our staff takes the necessary time to treat you and provide you with the most adequate surgical and/or non-surgical recommendations to ensure prompt and safe healing. Monday - Friday: 3:00 p.m. - 8:00 p.m.
Saturdays: 9:00 a.m. - 2:00 p.m.
South Florida, Miami, Coral Gables, Pinecrest, Palmetto Bay, Cutler Bay, Dadeland, Coconut Grove, South Miami, Kendall, The Falls, Suniland, Glenvar Heights Homestead, and the Florida Keys. Copyright © Orthopaedic & Sports Medicine Center Of Miami PA All rights reserved.